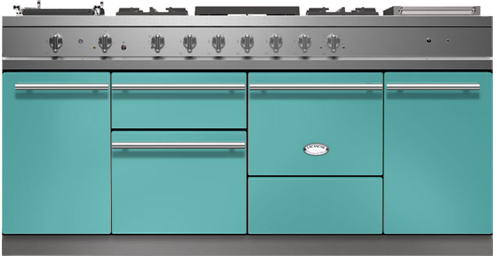 The Chagny 1800 builds on the Chagny versatility, cooking power and performance by adding a vertical warming cupboard on either side of the two dual-fuel ovens. 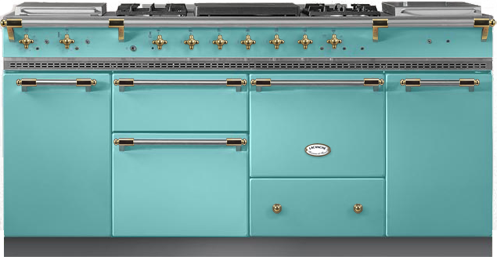 The small and efficient broiling oven sits atop a full-size electric oven complemented by your choice of either a gas or electric oven on the right-hand side. The additional hob space allows you to enjoy a stepped array of up to nine burners (or eight and a cast-iron simmer plate), or enjoy additional working space with one or two stainless steel workstations.